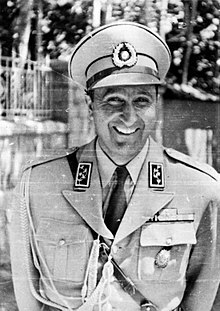 The 1953 Iranian coup d'état, known in Iran as the 28 Mordad coup d'état (Persian: کودتای ۲۸ مرداد‎), was the overthrow of the democratically elected Prime Minister Mohammad Mosaddegh in favour of strengthening the monarchical rule of Mohammad Reza Pahlavi on 19 August 1953, orchestrated by the United Kingdom (under the name "Operation Boot") and the United States (under the name TPAJAX Project or "Operation Ajax"), and the first United States covert action to overthrow a foreign government during peacetime. After the first coup attempt failed, General Zahedi, declaring that he was the rightful prime minister of Iran, shuttled between multiple safe houses attempting to avoid arrest. Mosaddegh ordered security forces to round up the coup plotters, and dozens were imprisoned. Believing that he had succeeded, and that he was in full control of the government, Mosaddegh erred. Assuming that the coup had failed, he asked his supporters to return to their homes and to continue with their lives as normal. The Tudeh party members also returned to their homes, no longer carrying out enforcement duties. The CIA was ordered to leave Iran, although Kermit Roosevelt Jr. was slow to receive the message—allegedly due to MI6 interference—and eagerly continued to foment anti-Mosaddegh unrest. 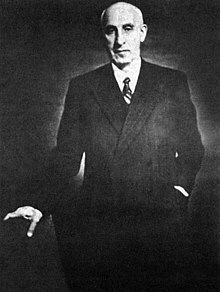 The Eisenhower administration considered changing its policy to support Mosaddegh, with undersecretary of state Walter Bedell Smith remarking on August 17: "Whatever his faults, Mosaddegh had no love for the Russians and timely aid might enable him to keep Communism in check." By the middle of the day, large crowds of regular citizens, armed with improvised weapons, took to the streets in mass demonstrations, and beat back the Tudeh party members. 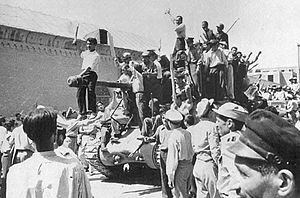 Under Zahedi's authority, the army left its barracks and drove off the communist Tudeh and then stormed all government buildings with the support of demonstrators. 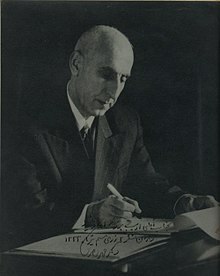 Mosaddegh fled after a tank fired a single shell into his house, but he later turned himself in to the army's custody. To prevent further bloodshed, he refused a last attempt to organize his supporters. 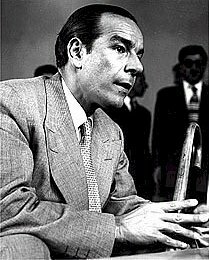 By the end of the day, Zahedi and the army were in control of the government. Despite the CIA's role in creating the conditions for the coup, there is little evidence to suggest that Kermit Roosevelt Jr. or other CIA officials were directly responsible for the actions of the demonstrators or the army on August 19. It has even been suggested that Roosevelt's activities between August 15–19 were primarily intended to organize "stay-behind networks as part of the planned CIA evacuation of the country," although they allowed him to later "claim responsibility for the day's outcome." ^ a b c d e f g h i j k l m n o p Milani, Abbas (1 November 2008). Eminent Persians. ISBN 9780815609070. ^ a b c d e f g h i j k l m n o p q r s t u v w x y z aa ab ac ad ae af ag ah ai aj ak al am an ao Milani, Abbas (4 January 2011). The Shah. ISBN 9780230115620. ^ a b "In declassified document, CIA acknowledges role in '53 Iran coup". Cnn.com. Retrieved 22 August 2013. ^ a b c d e f g h i Farrokh, Kaveh (20 December 2011). Iran at War: 1500–1988. ISBN 9781780962214. ^ "The Company File—From Anglo-Persian Oil to BP Amoco". BBC News. 11 August 1998. Retrieved 22 August 2013. 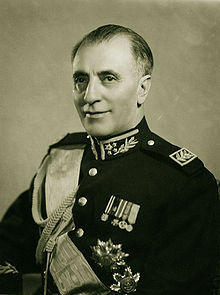 ^ a b "Shah Flees Iran After Move to Dismiss Mossadegh Fails". www.nytimes.com. Retrieved 26 February 2016. ^ "Helen Chapin Metz, ed. Iran: A Country Study. Washington: GPO for the Library of Congress". Countrystudies.us. 1987. Retrieved 22 August 2013. ^ "Dr. Mohammad Mosaddeq: Symbol of Iranian Nationalism and Struggle Against Imperialism by the Iran Chamber Society". Iranchamber.com. Retrieved 22 August 2013. ^ "CIA document mentions who ordered the 1953 coup" (PDF). Retrieved 22 August 2013. ^ "Review by Jonathan Schanzer of "All the Shah's Men" by Stephen Kinzer". Meforum.org. 1 June 2004. Retrieved 22 August 2013. ^ James Risen (16 April 2000). "Secrets Of History: The C.I.A. in Iran – A special report. How a Plot Convulsed Iran in '53 (and in '79)". The New York Times. Retrieved 22 August 2013. ^ "Iran's Rouhani tells UN: we pose no threat to the world: Iranian president addresses UN general assembly and says the world is 'tired of war' and US should not threaten force in Syria". The Guardian. 25 September 2013. ^ "64 Years Later, CIA Finally Releases Details of Iranian Coup". Foreign Policy. Retrieved 25 June 2017. 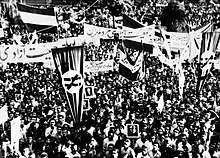 ^ "New Findings on Clerical Involvement in the 1953 Coup in Iran". National Security Archive. 7 March 2018. Retrieved 9 July 2018. ^ a b c "Goodman-Abrahamian interview". Democracynow.org. Retrieved 22 August 2013. ^ ""Obama admits U.S. involvement in 1953 Iran coup" 4 June 2009, Agence France-Presse". 4 June 2009. Retrieved 22 August 2013. ^ Cooper, Andrew Scott (9 August 2011). The Oil Kings. ISBN 9781439157138. ^ a b Abrahamian, Ervand (1 October 1992). 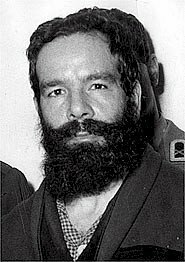 The Iranian Mojahedin. ISBN 9780300052671. ^ "A short account of 1953 Coup". Iranchamber.com. Retrieved 22 August 2013. ^ Cited by Richard, Y. (1983). "Ayatollah Kashani: Precursor of the Islamic Republic?". In Keddie, N. (ed.). Religion and Politics in Iran. Yale University Press. p. 109. ISBN 978-0300028744. ^ Staff, Writer (2 November 2017). "Viewing US as an enemy is not prejudice, but derives from experience". khamenei. ^ Takeyh, Ray (16 June 2014). "What Really Happened in Iran". Foreign Affairs (July/August 2014). ^ "Javad Zarif on Twitter". Twitter. Retrieved 19 August 2018. This page was last edited on 22 April 2019, at 15:07 (UTC).